One news story from 50 years ago at the PGA Championship might explain why no one has touched a record set that day. Julius Boros had to watch in front of him as Arnold Palmer made one last charge in the 1968 PGA Championship. Palmer thrashed a 3-wood out of the rough to 8 feet on the 18th hole at Pecan Valley in San Antonio, only to miss the birdie putt to tie for the lead in the only major he never won. Boros needed par to win, and he left his approach 45 yards short. “With the heat at 103, the pressure on full force, and 14,000 spectators jammed around the 18th green, Boros nonchalantly chipped to within 3 feet of the pin and popped the winning putt into the cup,” the story said. Boros was 48, making him the oldest major champion, then and now. Tom Watson was an 8-foot putt away from winning the 2009 British Open at Turnberry at age 59. A year earlier, Greg Norman was 53 when he took the lead into the final round at Royal Birkdale and shot 77. Norman did that when he was younger, too. Links golf, which leans more on skill and creativity than youthful power, seems to expand the age limits for winning majors. Only two players in their 40s have won the last 80 majors over two decades on U.S. soil. 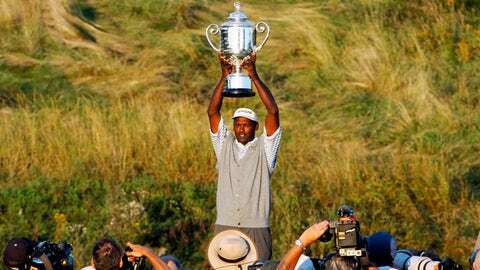 Vijay Singh, who holds the PGA Tour record for most victories (22) in his 40s, won the 2004 PGA Championship at age 41. Payne Stewart was 42 when he won the 1999 U.S. Open at Pinehurst No. 2, four months before he died in a plane crash. No one would be surprised if a player in his 40s won the PGA Championship at Bellerive Country Club in St. Louis, which starts Thursday. Phil Mickelson, Tiger Woods, Paul Casey and Matt Kuchar are all in their 40s. Five players in their 40s have won on the PGA Tour this year. Four of them won last year. There’s just not much recent history to suggest it will happen in an American major. Mark Calcavecchia won the Canadian Open when he was 45. He won at Innisbrook in Florida when he was 46. He had two chances on Sunday in the majors after turning 40, and he didn’t break par either time. There have been plenty of close calls, mostly involving Mickelson, who is among the best to ever play. Mickelson won the British Open in 2013 at Muirfield. He lost the 54-hole lead in the U.S. Open at Merion that same year at 43, and he finished runner-up in the PGA Championship at Valhalla when he was 44. Kenny Perry was 48 when he lost a two-shot lead with two holes to play in the 2009 Masters, and then lost in a playoff to Angel Cabrera. Four years later, Cabrera was 43 when he lost the Masters in a playoff to Adam Scott. Stephen Ames was 43 when he played in the final group of the 2007 PGA Championship with Woods, which was never going to end well. Jim Furyk was 42 when he fell out of the lead with three holes to play in the 2012 U.S. Open. “If you look at soccer, tennis, it seems like the better players are all playing later,” Rory McIlroy said. “There’s more knowledge out there, you learn to pace yourself, longevity, all that stuff. They still have chances. … But when you play for so long, maybe it’s the weight of expectations. You start playing more careful. With the innocence of youth, you don’t see the negatives. One reason for European-born players going 78 years without winning the PGA Championship was because for many years, hardly any Europeans were invited to play. Likewise, the field at Bellerive features only 21 out of 136 players (excluding the 20 club pros) in their 40s. Each year brings more youth, and they are better than ever. Jack Nicklaus set the Masters record when he won at age 46, which seemed more ancient in 1986 than it does now. The British Open record still belongs to Old Tom Morris, who was 46 when he won in 1867. Hale Irwin holds the U.S. Open record by winning in 1990 at age 45. Not only did he win the 1968 PGA Championship at 48, he lost the Westchester Classic in a playoff when he was 55. He died in 1994, and author and golf historian Herbert Warren Wind offered this assessment of Boros to The New York Times.